Recently unearthed in an excavation near Al Kharid, this document is one of the very few first-hand accounts to survive from the God Wars. When I first saw Elspeth I was at the edge of my village, looking out over the Front. Two distant lines of fire stood out against the evening landscape, like smouldering coals thrown across a dark blanket. Sparks would shoot across the gap between the lines, burning arrows or war-mages' spells. I couldn't see individual soldiers, but sometimes I could see blue and red lights circling above the lines, icyene and demons locked in aerial combat. I've always been told it was impossible to hear the sounds of battle from this distance, but sometimes, when the wind was right, I imagined that I could: the heroic battle-cries of our icyene commanders, the blare of signal-trumpets, the savage screams of demons. I was straining to hear the sounds of battle when I noticed the crunch of footsteps on the path leading up to my village's plateau. I watched the bend in the path until the visitors came into view. At first I thought I was seeing an adult leading a group of children, but then I saw the feathered wings folded at the leader's back and realised that he was an icyene, and what I had taken for children were ordinary-sized humans. There were a dozen soldiers on foot, and one figure riding side-saddle on a white horse: a woman, wrapped in a grey cloak and clutching something in her arms. At the time I didn't look twice at her; my eyes went back to the radiant giant leading the group. An icyene! A holy icyene of Saradomin was visiting our village! I ran back to the village hall and breathlessly told Elder Tasgall what I'd seen. He looked up from his meal wearily, then held out a hand. I passed him his crutch and helped him stand; Tasgall had lost one of his legs at the Front ten years ago. "We might as well start rounding people up," he sighed. Elder Tasgall was right. When the icyene and his party arrived at the village an hour later and Elder Tasgall met them at the gates, the first thing the winged figure said was, "I am Sergeant Mazakon of the Army of Saradomin. Assemble your people in your great hall. We will address your village tonight." "Golem limbs," someone beside me whispered. "They make them in Uzer." "Why doesn't Elder Tasgall have one?" I asked. "Don't be silly," my friend said. "They don't make them for humans." I wondered if Sergeant Mazakon was away from the Front because his golem limbs prevented him from fighting. His wings, too, looked crippled: they were huge and impressive, but they never moved, as if the tendons that worked them had been damaged. "People of Saradomin!" Mazakon boomed. "I am here to present to you one of your own! A human, though with icyene blood in her veins. A holy warrior who has slain a dozen of Zamorak's demons, not with a sword or spell, but with her voice! And she is here now to sing to you tales of the War. Ladies and gentlemen--Elspeth of the Cithara!" Mazakon stepped aside, and the woman who'd arrived with him walked to the centre of the stage. In her hands she held an instrument like a lyre or small harp. She had shed the grey cloak, and beneath it she wore a white dress cut to show off her figure. There were some catcalls from the audience as she walked forward, but everyone went quiet when she plucked her cithara and started to sing. Her voice was heartbreakingly beautiful. As soon as she began singing I was transported to a world of glorious battle, of absolute good vanquishing absolute evil, of icyene and demons duelling atop the towers of legendary cities while the joyous army of Saradomin marched forward to victory. Watching the beautiful icyene-blooded woman, hearing her perfect, piercing soprano voice, I think I fell in love with her right then. I think every young man in the audience did. She sang a song from the point of view of a soldier's sweetheart, about how proud she was of her man, and how she knew Saradomin would send him home safely. She sang about a soldier dying on the battlefield and looking back over his service, thinking how proud he was to be dying for Saradomin rather than growing old. She sang about the icyene commanders waiting at the Front, knowing that they could achieve a decisive victory if only a few more good men came to their aid. "Who will fight with us?" went the refrain, Elspeth's haunting soprano floating above the cithara's chords. "Who will fight with us today?" "I'll fight with you!" I shouted, finally breaking the audience's silence. Everyone around me was shouting as well. "I'll fight with you!" That night was to be the last I'd spend in my own bed before we marched for the Front, but I couldn't sleep. I found myself wandering the village, wrapped in a thick coat to protect myself from the chill. The clouds had dispersed, and a gibbous moon flooded the village in ethereal light. Lamplight spilled through the shutters of Elder Tasgall's house. As I walked past I could hear raised voices coming from inside. I didn't intend to eavesdrop, but the voices were too loud for me not to hear. "You're taking too many, too soon," Tasgall said. "The village won't be able to sustain itself if you steal all our young people." The other voice was Mazakon's. "Those youths nobly volunteered to serve Saradomin. Would you deny them their right?" "Your icyene-blooded sorceress enchanted them." "You should be glad your village is in Saradomin's territory. Do you know the Army of Zamorak's recruitment tactics?" Mazakon's authority made Tasgall sound like a child arguing with his elders. "Kidnapping, torture and brainwashing, I know. I am grateful to the Army of Saradomin, but..."
"But you think you know better than the Icyene High Command how to use the army's resources?" "I didn't say that," Tasgall said, defeated. But then he blurted: "But what good does sending whole villages to the Front do? The lines haven't moved since I fought there." "This is why there are no humans in the High Command," Mazakon said sternly. "You don't live long enough to see the whole picture. The Front has moved twenty kilometres south in the last hundred years. Zamorak sends powerful demons to raze every settlement they can reach. If we stop pushing back, Uzer itself could be in danger." Uzer was the pinnacle of our civilization, safe far behind the Front--surely it could never be in danger? The idea shocked me so much that I didn't hear the footsteps coming towards me on the frosty ground. The first I knew I was not alone was when I felt a hand on my shoulder. I span around, intensely guilty for having eavesdropped. It was Elspeth, the singer, wrapped once more in her huge grey cloak. "I don't have icyene blood," she said. "Sergeant Mazakon added that part of the story. People didn't believe that an ordinary human could do the things I'd done." I couldn't help staring. For an ordinary human, her beauty was even more exceptional. "But the way you sang..."
I didn't contradict her, but I knew that no ordinary mortal could have sung the way I had heard Elspeth sing. Perhaps she was icyene-blooded and didn't realise it, or perhaps Saradomin had chosen to bless her with her supernatural voice. Elspeth glanced around. There was no one but the two of us outside. Mazakon and Tasgall were still talking, but their voices were no longer raised; it sounded like Tasgall had seen the folly of arguing with an icyene and backed down. "Would you like to hear another song?" Elspeth asked. I felt my heart leap in my chest. "More than anything." She led me out of the village, to the lip of the plateau where I had first heard her party approaching. There were lights flickering from part of the Front, as if the two smouldering lines were grinding against one another and throwing up sparks like a sword on a whetstone. My heart went out to the brave warriors of Saradomin fighting in the orange light, and I prayed that they would break through the Zamorakian lines and push the Front forward a little way. Elspeth sat on a flat rock near the edge of the plateau and stroked the strings of her cithara, sending a simple, melancholy tune floating into the night air. When she began to sing--Saradomin forgive me--I forgot all about the Front. The song was beautiful, but I didn't understand it. It was a love song, like the first one she had sung to the village, but rather than being off fighting at the Front, the singer's beloved was there with her. I wondered if the man had returned from the war, but the second verse mentioned that they had grown up together and never been apart. Then I thought that the song was about someone who realized their duty late in life and went off to war, but it ended with the couple growing old together. There had been no mention of the war, or of Saradomin. The last cithara chord was swallowed by the frosty air, leaving me confused and angry. "He didn't go to war," I said. "Who would write such a beautiful song about a coward?" Elspeth looked hurt, and I regretted my tone of voice, although not my words. "He wasn't a coward," she said. "That song dates back to before the war." That made me more confused. How could a song date back to before the war? "How did you learn it?" "From an icyene. I translated it from their language. Icyene and demons live much longer than us. A lot of them remember the time before the war." "Then sing it for them. It doesn't mean anything to us." Elspeth hugged her cithara to her chest, drawing away from me. "I thought someone might understand." I wanted to say something--the last thing I wanted was for Elspeth to be upset--but then I noticed another sound. It was a high-pitched whistle, a little like the shriek of a bird; it sounded like it was coming from the direction of the Front. "Hush! What's that?" Elspeth's face creased up in despair. "It's found us." The sound came closer second by second, and before long I saw its source, an orange spark that grew into a fireball. It looked like it was heading straight for us but then it shot overhead, bathing us in orange light and heat, nearly deafening me with its horrible cry. There was a crashing sound from the direction of the village. I ran towards home, stumbling in the darkness. I could hear Elspeth running beside me, but I left her behind. I couldn't see what was happening behind the outermost row of houses, but I could hear the shouts and screams, the crashes of collapsing buildings, the inhuman snarls. Sergeant Mazakon's voice boomed out above the carnage. "Now is your chance to prove yourselves! Defend your homes!" I reached the village gate. Two houses were burning where the fireball had crashed through them, and by the light of the flames I could see the battle in progress at the other end of the main street. Several of my friends lay dead or dying on the ground, their bodies twisted, gaping wounds glistening in the firelight. Among them lay the bodies of the soldiers who had arrived with Mazakon and Elspeth. The icyene stood at the far end of the road, bleeding from a gash on his arm but undeterred: an immovable rock of a soldier, blessed by Saradomin with superhuman power. He towered over the burning buildings and swung around his head a sword as large as a man. The creature Mazakon was fighting was too small and fast-moving for me to see clearly. I got an impression of a ball of dark rags, tattered cloth flapping behind it as it leapt and ran. It slashed at Mazakon with long bloody claws and then jumped back, dodging as the icyene struck down with his mighty sword. I ran forward and grabbed a sword from beside the body of one of the fallen soldiers. But then, may Saradomin forgive me, I hesitated. I should have thrown myself into the fray: the creature would have killed me in a moment, but that moment might have distracted it from Mazakon and given him the chance to smite it. Mazakon looked in my direction, his eyes furious. The creature's last attack had left three wide claw-marks across his chest that were streaming with dark blood. I thought he was going to order me into the fight, but he was looking past me. "Sing, useless human woman!" he yelled. "Sing, or Zamorak take you!" I spun around. Elspeth was shaking with fear, tears streaming down her face, but she obeyed her sergeant's order and raised her cithara into playing position. Her fingers plucked the strings and a chord rang out, then another. I recognised the beginning of the first song I had heard her play in the town hall, the one about the young sweetheart waiting for her soldier to return. Then Elspeth sang the first words of the song. Her voice trembled at first, but became loud and clear after the first few notes. The demon stopped in its tracks, skidding on the gravel. It howled skywards and covered its ears, its long claws locking into a cage around its head. It was as if the woman from the song were standing there in Elspeth's robes; it was as if her love and her faith projected a barrier that the demon could not cross. Then the demon hissed and ran off between the houses, stumbling and blundering into buildings but moving faster than I could hope to follow. The spell was broken. Elspeth stopped singing, but her hand kept working the strings of the cithara, improvising a slow sequence of chords. I could hear the crackle of fire consuming the houses behind me, and the groans of the dying. I ran over to Sergeant Mazakon. He was on his side now, unconscious. His armour was in tatters and drenched in blood. His clay left arm had been shattered, leaving a stump like a broken pot rim. I wanted to treat him but I didn't know where to start: close to, I could see his musculature was entirely different from a human's. "We should get him indoors," Elspeth said over my shoulder. She glanced around, still strumming the cithara. "We should get everyone in the hall. It could come back at any moment." I poked through the ruins, finding the villagers cowering in their homes and telling them to gather in the village hall. People didn't argue; they seemed glad that I was taking charge. Elder Tasgall was dead. I nearly threw up when I saw his body. He'd been sliced clean in half by the demon's claws, his torso and legs lying on opposite sides of his house's door as if he'd made a heroic but futile last stand. Everywhere I looked there were body parts, some so mutilated I couldn't tell what or who they had once been. I found more bodies than survivors, and even those who weren't wounded were terrified, huddling wild-eyed in the ruins of their lives. The village hall was filled with sweat and fear, the heat of the bodies and the fire driving away the chill of the night. Elspeth stood just inside the doors, plucking at the cithara and singing a mournful reprise of her concert from earlier that night. The survivors sat watching her, cradling children, latching on to her music as their only respite from the horror that had come to our village. She looked radiant, her grey cloak seeming to glow white, and even though her eyes were red with tears her voice still pure and perfect. No, I can't believe she was merely human. There was icyene blood in her, whether she knew it or not. She wasn't singing for us, though. I spoke to her in between songs, although she kept plucking at the cithara, never letting the music stop entirely. "I can't stop for long, or it'll be back," she said. "It's the Ripper," Elspeth said. "An assassin demon. Zamorak's army sends them to kill important targets." I glanced at the huge form of Sergeant Mazakon, sprawled out at the back of the hall. Some of the women were tending to him; they had cleaned and bound his wounds, but besides that they had told me there was nothing they could do. His anatomy was alien to them, and what they knew of medicine didn't apply. "Can you drive the Ripper away?" I asked. Elspeth shook her head. "I can keep it at bay, but that's all. We just have to hope Sergeant Mazakon recovers and can think of something." She plucked a series of melancholy chords. "I'm sorry." "For bringing this on your village." I thought back to the faces of my dead friends, gruesome in the firelight. "They died for Saradomin," I said. "If they slowed the Ripper down so it didn't kill Sergeant Mazakon, then that was worth it." Elspeth didn't say anything to that. She looked back outside and began singing, this time the song about the soldier dying on the battlefield having faithfully served Saradomin. In the distance the howl of the Ripper demon rose to the sky. After a couple of hours, Mazakon stirred, opening his eyes and lifting his remaining arm a few inches. He muttered something through half-closed, blood-encrusted lips. I crouched down close to him, but he was speaking a language that I didn't recognise. I couldn't tell if Mazakon could hear me. He began to sing, his deep voice weak and faltering. The words were in his icyene language, but after a few notes I recognised the melody. It was the song Elspeth had sung for me on the plateau, just before the disaster struck us. The song from before the war. Half way through the second verse, Mazakon's voice drifted into silence. His heavy hand slipped through mine and fell onto his wounded chest. He didn't regain consciousness again. An hour later he was dead. Elspeth barely reacted when I told her. She had been singing and playing constantly for several hours now, and her voice was barely cracking, but her eyes looked half-dead. In between songs she plucked the cithara mechanically. "You should move his body outside," she said flatly. "If the Ripper knows he's dead, hopefully it'll leave." I hesitated, struck by the horrible image of the Ripper mutilating Mazakon's winged corpse. "He's an icyene. He deserves a proper burial." "We can bury what's left. Take him outside. It's what he would have ordered." I rounded up a few of the stronger survivors and we moved the icyene again, this time hauling him out past where he had fought the Ripper and as far along the path as we dared. Elspeth walked with us, singing to keep the demon at bay. "The icyene is dead!" I shouted into the night. "You've completed your mission! Why don't you leave?" A distant howl responded and I ran back to the hall. I stood with Elspeth at the doors and looked down the road. The fires had died down, but I could see Sergeant Mazakon's body in the moonlight. Elspeth was singing quietly, the melody still perfect but all the emotion long gone from her voice. After a couple of minutes I saw movement, as a dark rag-wrapped shape rushed to the body from between two houses. There was a sickening crack of tearing flesh and bone, and then the Ripper raised its claws to the sky and let out a blood-chilling howl. "Leave us alone," Elspeth whispered tearfully, still plucking chords with trembling fingers. "Why can't you leave us alone?" The Ripper looked right at us, red eyes smouldering from beneath its ragged cloak. It hissed, and began to walk towards us along the road, claws slashing left and right as if cutting through the forest of sound that had been keeping it at bay. "What does it want with us?" I exclaimed. "It's killed its target!" "No, it hasn't," Elspeth said. Her fingers plucked the same few notes over and over, as if she were no longer thinking about the music. Her eyes widened, and her voice trembled, as if a horrible realisation were coming over her. "It wasn't here for Sergeant Mazakon. It's here for me." Elspeth stepped across the threshold, out into the street. I stepped in front of her. "What are you doing?" "I can't sing forever. If it kills me, it might spare the rest of your village." She tried to walk past me, but I moved in front of her again. "I can't let you do this." "Let me come with you. Let me fight it for you." She shrugged, as if she didn't have the will left to argue. Elspeth and I walked up to where Mazakon's body lay on the village path, our feet crunching on the frosty gravel. Elspeth held her cithara under her arm, although she had stopped playing; I carried the sword I had taken from the dead soldier. The Ripper hissed and stood upright, stretching its massive claws out on either side. There was a stench of blood; Mazakon's body was a mutilated mess, and blood dripped from the monster's claws. I could hear my heart pounding in my chest, but this time I was not paralysed with fear. I would like to say that my faith in Saradomin sustained me, but in that moment I think it was Elspeth who kept me moving. I would fight for her--if the demon wanted to kill her, it would have to get through me first! I let out an inarticulate cry and ran at the demon. It snarled, and then pain erupted in my leg as I was thrown aside. I heard a crack of bone. I tried to lift myself, but I couldn't. The demon had swiped at me with the back of its claw; I wasn't badly bleeding, but my legs were broken. The sword lay on the ground out of my reach. The Ripper recoiled, clutching its ears. Elspeth's voice was tired and cracked, but still achingly beautiful, making me forget my pain. She was singing a familiar tune in a strange language. It was the same thing that Sergeant Mazakon had sung in his delirium: the icyene love song from before the war. The Ripper let out a moan, a very human-sounding cry of anguish. It lowered its claws, and cocked its head to one side. It was listening, I realised: listening as if the song awoke some wholesome memory in its evil Zamorakian heart. The spell broke, as if the Ripper's bestial nature had won out over whatever emotions Elspeth's singing had triggered in its heart. It lunged forward, grabbed Elspeth in one claw and ran the other one through her chest. Her cithara fell to the ground. But somehow she transformed her scream of pain into the song's arching descant, one piercing note that felt like it could stop my heart. 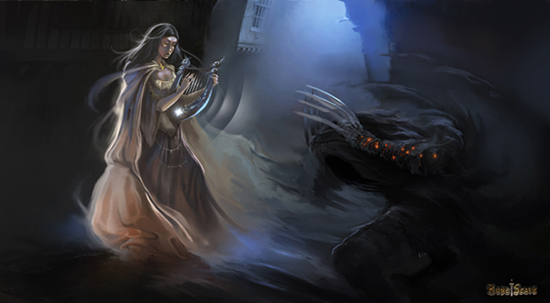 With Elspeth in its claws, the demon could not cover its ears: it took that piercing note full in the face. It dropped Elspeth to the ground and staggered back, whimpering. For a moment it looked at me. The red glow was fading from its eyes. The sun was rising behind me, and in its light the demon's face looked very human, locked in a mask of anguish, its aggression gone. It clutched its claws to its chest and then bent in on itself and fell forward onto the gravel next to the unmoving form of Elspeth. A few moments later it smouldered and collapsed into a cloud of sulphur-smelling smoke and a pile of ash. Some of the village women found me and tended my wounds. They set my legs well, and I made a full recovery. The village as a whole was not so well-off. We had lost our leader, and every family had lost loved ones. Over the next few months the survivors travelled to other villages to make new lives, leaving ours a ruin. I buried Elspeth on the edge of the plateau, overlooking the Front. I buried her cithara along with her; it was undamaged, but it didn't seem right to me that anyone but her should play it. I walked towards the Front until I found a recruiting post, and joined the Army of Saradomin. When the recruiting sergeant interviewed me I told him the story of Elspeth, how Saradomin had granted her the strength to sing one final piercing note that struck the demon dead. I told the same story to my squad-mates, and to everyone who would listen. It's become a common inspirational tale, passed around from soldier to soldier: the image of the icyene-blooded maiden giving us hope on the front lines. The officers have picked it up as well, and I've even heard rumours that High Command are moving to recognise Elspeth as a saint. That was five years ago. I've been on the Front for most of that time, and I've seen several assaults, both from our side and from the Zamorakians. The latest Zamorakian assault punched through our lines, moving the Front south. My squad retreated without me, thinking I was dead: I'm trapped in a dug-out that collapsed under a chaos mage's earth surge. My legs are broken again, and I know I'll die of thirst before I'm rescued. As I lie dying, I think back to Elspeth's songs. I can hear her clearly, as if she were in the dug-out with me, the rich harmonies of her cithara underlying her beautiful, holy, triumphant voice. Feebly, I sing along with my memory. But for some reason it's not the song of the dying soldier that gives me hope in my final moments: it's the song from before the war.